Maybeline Dream Mousse Eyecolor in 11 Fablous Turqoise as a base. Medium blue all over the lid mixed with the brown/silver colour below to make it darker. 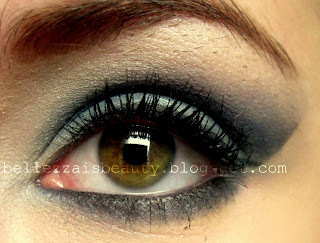 Dark blue colour to in the crease to blend the two blues together. Black in the outer corner blended up into the crease.